Hello my Ninjas! Tonight my mani turned out exactly how I'd envisioned...doesn't happen often! 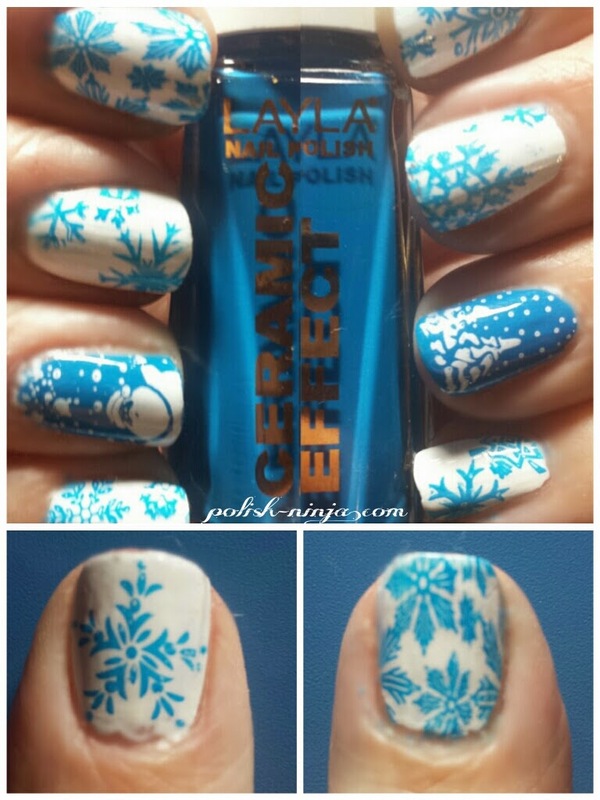 So, I'll jump to the details of my Christmas Snowflake Blue & White stamped mani :-) I'll make a note in parenthesis fit where I got all of my supplies. I think I forgot a plate but everything is put away so I'll update later! 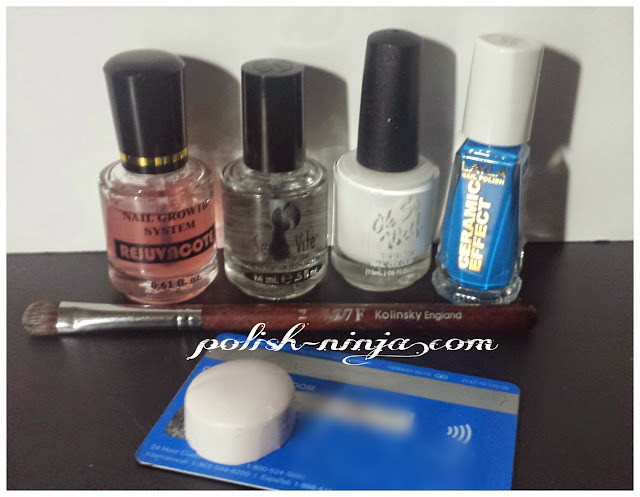 Old debit card for scraper, the white end of my squishy stamper (well loved and used forever from NinjaPolish.com) and my favorite clean up brush (local supply store). 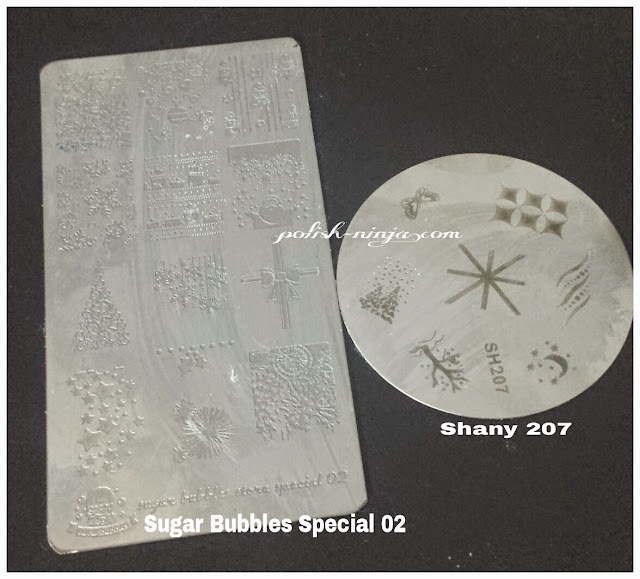 I used various snowflakes from OB-M plate at different angles and partial on my nails to make them look like this. Left thumb, right first finger & both accent nails were full nail patterns. 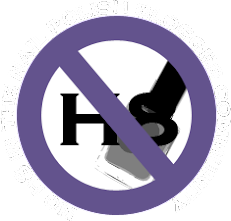 I have been needing to do a serious polish purge for some time now!! My life is finally settling down and I am getting back into somewhat of a normal schedule, not to mention a more normal emotional state of being! Yippee!! Now that I have some fun legal bills to take care of thanks to my greedy, entitled ex who decided to drag the divorce out for a pointless year and a half digging for gold where he KNEW there was none, well guess who got the gold? The lawyers!! Anyhoo....I had better start getting rid of excess stuff to get bills paid off! Not to mention Christmas is RIGHT around the corner and our girls really deserve a good one after the year they have had. Mystery bags will be pulled from my personal stash which is vast and has a WIDE variety of polishes. So with that said, please visit my new mini shop to purchase your mystery bag(s). I can't guarantee contents but please feel free to tell me your likes and dislikes in the order notes. I will do my best but no guarantees!! *Please note that this is NOT Ninja Polish old inventory. That liquidation will take place on NinjaPolish.com when that time comes. There is a lot of overlap in brands with Ninja, but I have more brands than that up for offer in these bags. Long time no post!! Well my life took a pretty upside down turn a year and a half ago. I tried to keep everything going during that time but after awhile it was too much. They say there are 4 events in your life that can be the most emotionally devastating to endure. I went through 3 of these events simultaneously and they lasted for months and months and months with no end in sight for quite awhile. For the curious folks out there, I had the company I worked for announce a merger, which for while meant I had no idea if I would continue to be employed or not. When details were sorted out, it meant not only a job change for me but also a move to another state, all while battling through an ugly divorce that started before the merger announcement! Thankfully I am now moved, somewhat settled into my new home in a new state (hello Florida sunshine! )....getting settled into my new job role in my day job and the divorce is finally, FINALLY final! The last piece was the hardest to endure and there were honestly days I wondered if I would live to see the end of it! Thankfully I am on my way back to looking forward to a normal life!!! 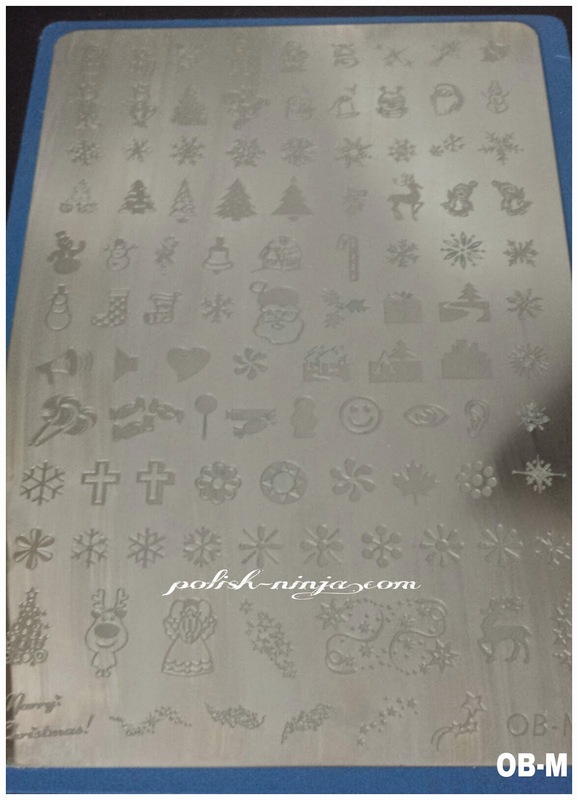 I wanted to give a huge thank you to all of my blog followers as well as my customers/fans of Ninja Polish as well. Those of you that have shown me such amazing support even through my darkest times are just incredible. You have no idea how much even the smallest words of support and encouragement meant to me during that time and still now. Sometimes the shortest, simplest word of support would have me in tears of thankfulness that day. I needed those desperately during my healing. I also wanted to give a huge apology to everyone that was put on the back burner during this part in my life. During the dark time I could not handle even the slightest conflict or even the *thought* of potential conflict. It is a strange thing to try to describe to anyone who hasn't been there. I lost close "friends" through this who did not understand the state of emotion I was living in, a dark hole that I am thankful they never had to experience in order to understand. I remember being told that it just seemed like I was burying my head in the sand and refusing to deal with things....there was truth to that however the refusal to deal directly with some things was for my own emotional well being...I tried to find solutions and help to keep things going, but the help I needed was not there in many ways and I finally had to close...I know I should have closed earlier than I did, which many folks told me. I just loved my business so much that the thought of it going away was devastating and it still crushes my heart to think it is closed. Through this time I also discovered friends that were far more amazing and supportive than I ever thought. True friends came to light while the fair-weather-friends have been weeded out. Polish is one of my passions and I love it. I miss Ninja Polish desperately and I miss making polish.  I know the polish world is wondering if Ninja Polish is coming back and I don't have that answer for you yet. I want to, yes, but there are necessary changes and tying of loose ends that are required before I can start on that commitment again. 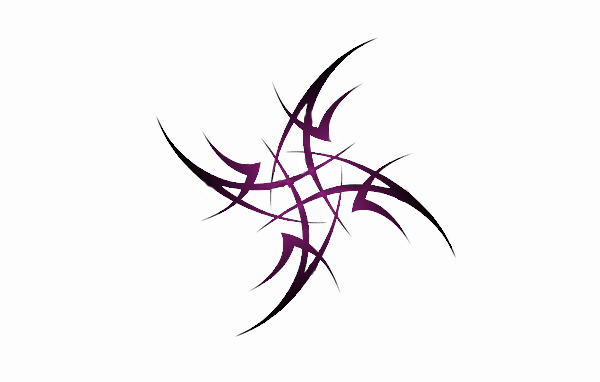 I am trying to work on those changes, loose ends, remaining responsibilities that were left for me to deal with not to mention rebuilding a new website basically from scratch. I am hopeful things will work out but the necessary T's and I's must be crossed and dotted before I can move forward. For now I am going to try to blog occasionally to ease my way back into my passion. I have loads of extra polish in my stash I will be destashing via mystery bags, so keep you eyes peeled for that. What is left from the Ninja Inventory is in on hold until those T's and I's are crossed. Lots of Ninja debt to take care of with that inventory before I can rebuild, but I gotta get those T's and I's crossed before I can even start doing that. We will see how things unfold in the future. Thank you again for all of your amazing support. I love you all!! !